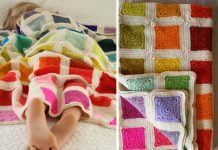 Rainbow Afghan Blanket Crochet is an amazing and gorgeous pattern that you really shall try. It is a old pattern around 30 years ago but looks still impressive and beautiful today! 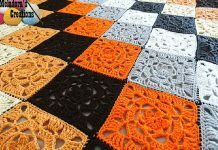 The afghan blanket size is 48″ wide x 64″ long. Use your favourite color to make the blanket look even better. Choose a soft yarn that is machine washable and durable. You can easily adjust it bigger or smaller. The rainbow pattern will light up your home everyday! It will be a great gift for baby shower, wedding or other celebration. 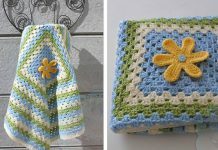 Thanks Craftingranny’s Craft and Sewing Room for sharing this free crochet pattern. The link for the free pattern is provided below photo. Happy crocheting.